Google Spreadsheets, probably the most impressive application from Google Docs, tests some interesting features that are currently experimental and limited to trusted testers. One of the features lets you record macros for common tasks. Instead of repeatedly selecting the formatting for a cell or a group of cells, you can record the sequence of commands that perform the formatting and click on a button to use the macro. Another feature, code-named "Sketchy", allows you to insert different drawings. Tony Ruscoe spotted some of the images that will be available in a library that resembles Microsoft Office's Clip Art. Google Spreadsheets' code also references an option titled "Solver", which could be a tool for solving optimization problems, and an option to protect sheets and cell ranges. 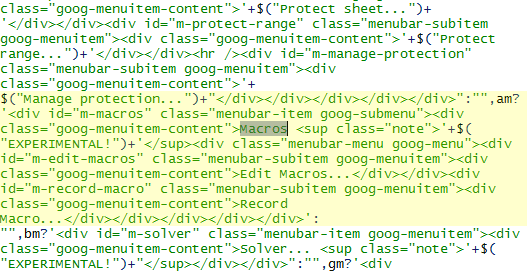 Update: Tony points to a post from 2008 with more details about macros in Google Spreadsheets. Whoops! I forgot about that post. The list view has been released, so now it's time to launch macros. I'm still waiting for macros. Any news since last year? macros in Google Spreadsheets would make it much more productive application. Looking forward seeing that functionality. Solver, as mentioned in the post, would also be very much appreciated. Macros? I don't want keystroke and mouse movement macros, I want user defined functions! Knowing by now the way the Google Docs team implements new features it will look great at first look and prove to be a big disappointment once you try to really do something with it; e.g. the Change Color by Rule and Data Validation features and even the List View that is not compatible with the Data Validation. But also the Google Charts and Gadgets that are really limited once you want to go beyond the basics. The new features most probably won't be compatible with similar features in Excel and OpenOffice Calc (except perhaps the Solver, for which circular references should be allowed to be compatible...)so that will be another minus for those expecting compatibility (the poor misguided). I do not know if macros will be so useful to me, I would like to have a more easy to implement feature that would be much more useful to me, I mean the possibility to allow editing by collaborators only for some cells... they have done cell-driven notification, why not doing also cell-driven authorization? It would be great to see something like VBA or .NET functionality in Google Spreadsheets. It would significantly increase functionality, make GS look more professional and attract more users. It's great to see GS developing rapidly now. In my view they need to come a fair bit longer to get my clients (Banks and large corporates) to start using it, but I am confident that in the long run Excel will loose its dominance in this space too. Your post inspired me to write a post on my blog about ways GS could impact my business (financial model audits) or an on-demand quality control of spreadsheets. I will keep track of developments of GS to be ready to start discussing it with banks when the product is ready for it. Release date? or estimate of it? I need to run macros on google spreadsheet too, please anyone help me..!